"The cranberry bog would serve as lawn” - Whitesbog Village ~ The History Girl! When one thinks of the Pine Barrens and southern New Jersey, visions of the Jersey Devil, winding sand roads through pine trees, and cranberry bogs come to mind. However, there is one achievement that comes out of the Pine Barrens that is often overlooked but is of national prominence. Whitesbog, in the southern New Jersey Pine Barrens, was once a classic company town. In its heyday, the surrounding bogs yielded thousands of barrels of cranberries and blueberries every year, harvested and processed by about 600 seasonal workers. The village, built between 1890 and 1925, was a self-sufficient hub, with worker housing, a general store, pay office, processing and storage buildings, and a schoolhouse. 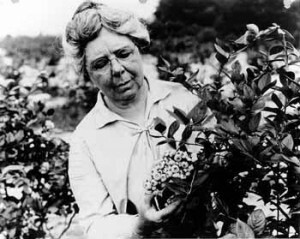 Elizabeth Coleman White, in 1921 successfully cultivated the nation’s first blueberry crop with Frederick Coville. To understand how Ms. White got to this crowning moment, one must first examine the broader scope of agriculture in the pinelands region. 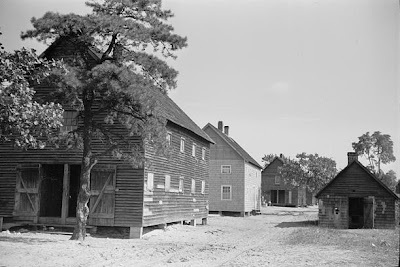 The first cranberry bogs in New Jersey are thought to have been cultivated in the 1830s by Benjamin Thomas at Burrs Mill in Burlington County. It was not until the 1850s that efforts at cultivation proved successful and the cranberry boom began. In 1857, a farmer from New Lisbon, Colonel James A. Fenwick, purchased 108 acres south of Hanover Furnace. In 1879, he bought an additional 490 acres south of his bogs creating a 600 acre tract. In 1846, Joseph Josiah White, was born at his father’s farm in Springfield Township, Burlington County. At the age of 14 he was given a parcel of land from his grandfather Restore S. Lamb. The land consisted of 100 acres on Rake Pond near New Lisbon, 30 of which J.J. found suitable for cultivation. The land needed many improvements over the next seven years before a crop could be harvested. He later acquired his brother’s 100 acre tract which he incorporated into the Rake Pond Cranberry Company, sold stock, and at the age of 27 became a successful farmer and businessman. It was at the Rake Pond bogs that he met Mary A. Fenwick, James Fenwick’s daughter and they were married shortly thereafter. J.J. and his wife spent their first winter together writing a book on cranberry culture. He wrote the text and she drew the illustrations. The book, “Cranberry Culture,” became a standard guide in the cranberry industry. In 1882, Fenwick died, naming J.J. as sole executor and manager of the cranberry property. J.J. moved back to New Lisbon and began acquiring adjacent tracts and added to the 600 acre farm. In 1912 when the Fenwick tract was joined with the White tracts under J.J. White, Inc., his holdings totaled over 3,000 acres with about 600 acres in cranberries. At this time, White’s cranberry farm was not only the largest in New Jersey, but a model for cranberry farms throughout the country. Mary and J.J. had four daughters. Their oldest was Elizabeth, born October 5, 1871. After graduating in 1887 from the Friends Central School in Philadelphia, she went to work in the family business. In 1911, around her 40th birthday, White began a public campaign to defend cranberry growers against charges of child labor abuse. Her efforts were successful, sealing her reputation as a leader in the all-male New Jersey cranberry business. At about the same time she read a United States Department of Agriculture pamphlet on blueberry culture. The blueberry pamphlet inspired her to contact botanist Frederick Coville that same year to ask for help in developing strains of local blueberries that could be cultivated alongside the cranberry bushes. Finally in 1916, the two successfully propagated and cross-fertilized the nation’s first cultivated crop of blueberries. Elizabeth had spent years exploring the woods, asking local residents about berry size, vigor, texture, productivity, and time of ripening in order to identify wild blueberry bushes with the most desirable traits. She was the first woman member of the American Cranberry Assocation and helped organize the NJ Blueberry Cooperative Association in 1927. White’s interest in agriculture did not end with blueberries. She formed a company called Holly Haven, Inc., which sold many varieties of holly, Pine Barren plants and a rare magnolia called Franklinia. After White's death in 1954, her relatives continued growing cranberries on a smaller scale, but the labor intensive blueberry business was abandoned. Today, New Jersey ranks as the second largest cultivated blueberry producer in the United States. Whitesbog Village was sold to the state in the 1960s and is now part of the Brendan Byrne State Forest. The Whitesbog Preservation Trust has leased the property from the state since 1982. Today, Whitebog Village contains a collection of twenty-eight buildings from the time period when Elizabeth White was in charge of the property. Suningive, Elizabeth White’s home, has been preserved and restored to its former splendor. White sited her large farmhouse to face the bogs. In her own words, "The cranberry bog would serve as lawn.” Suningive's ground floor, contained an office and a small infirmary. Injured workers were often treated by White, who had studied nursing. A worker’s cottage has also been restored, demonstrating the conditions under which seasonal laborers may have lived. Other homes on the property have been restored and are rented as a source of sustaining the historic property. The village also contains a school house and general store/post office. It was a true company town, sufficient of serving and housing its population. The 1918 cranberry experiment substation has recently been restored and is set up to resemble how it may have appeared in the early 1920s. The building itself is a Sear’s Sectional Building – the Sunburst model. It included a large front room, two rear rooms, and a screened porch. The substation was under the direction of Charles Beckwith. The triangular field behind the substation where the first cultivated blueberries were grown is currently being restored, after years of no maintenance. Some of the original blueberry bushes planted by Coville and White remain. Whitesbog also had two seasonal worker’s villages, Rome and Florence. The villages contained homes for workers and a community building. The villages were demolished in the 1960s by the State of New Jersey and today only remnants of foundations remain. Whitesbog has a bright future ahead of itself and is a monument to the woman who dedicated her life to improving agriculture. Thanks to the efforts of the non-profit, all of the remaining buildings have been stabilized and numerous former blueberry fields on the property are being restored so that future generations of New Jerseyites can understand the experimentation and innovation that took place at Whitesbog a mere 100 years ago. This is a great article...have to visit this one.